Teutonic Tuesday: Which Would You Rather? LOL. I’m just kidding about the asinine part. But seriously, bro. Srsly? We all know that the Mercedes W124 is the finest all-around car Germany has ever constructed. But instead of just relying on what we all know and accept as fact, I decided to put it to a vote. 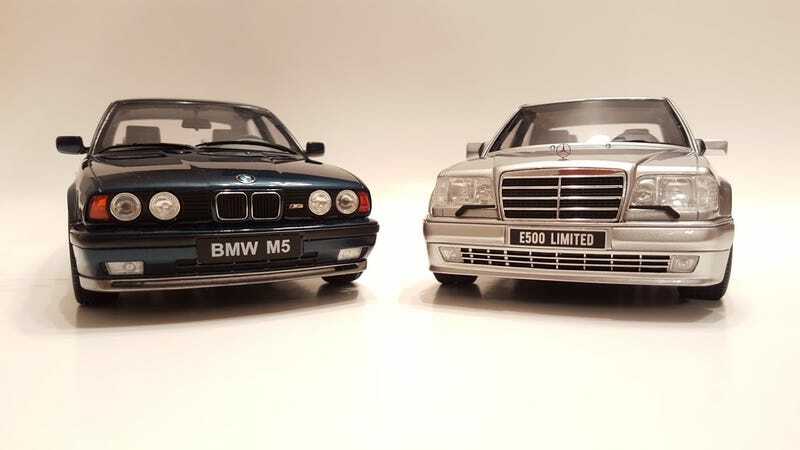 Now in the interest of fairness, the E34 will be subbing for the E39 as it is from the same era as the W124. Besides, it’s better than the E39 anyway. Don’t let the V8 media fool you, sheeple! The E34 M5 features BMW’s high-revving 3.6 liter (later 3.8l) inline 6 making around 307 bhp and 266 lb-ft of torque mated to a 5MT gearbox in a package weighing about 3800 lbs. It has the distinction of being the last hand-built M-series car. The W124 E500 goes the “no replacement for displacement” route and uses Mercedes’ M119 5.0l V8. While over a liter larger than the M5's motor, peak HP was only slightly higher at 322 bhp. Torques however, were considerably higher at 354 lb-ft, and both peak power figures come in about 1000 rpm lower than on the Bimmer. The 500e/E500 has the distinction of having significant parts of its assembly being done by Porsche, leading some E500 nerds to place Porsche’s crest on their cars and trying to crash Porsche owners club events. So given a set of keys to a pristine example of either car, which would you take? While there is only 1 right answer, there is no wrong one.